2019 Polaris Youth Models: Click here to view the models. Welcome to Finley Motorsports online! For all your ATVs, snowmobiles, and side x sides, look no further. 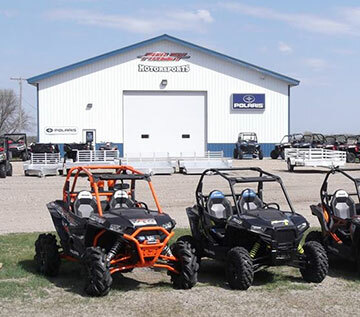 We carry the latest and greatest from Polaris, Fox Racing, and other trusted brands right here in Finley, North Dakota. Questions regarding any of our products? Call (701) 524-1200 or send an email to karl@finleymotors.com. We are here to serve you. Customers from Cooperstown, Mayville, Portland, Galesburg, Northwood and the surrounding area have come to trust the service, quality, and knowledge you will receive at Finley Motorsports. We are committed to make sure our customers are taken care of and keep coming back for years to come. It's no wonder customers and riders from Fargo, Devils Lake, and Grand Forks keep coming back: Our trained techs have years of experience in service and repair and our friendly sales staff is always eager to assist customers. We offer ATV service, snowmobile service, and side x side customization—so look to Finley Motorsports for ATVs, snowmobiles, and side x sides. We have tons of accessories for our Rangers and or ATV give us a call and see what we can do to accessorize your unit.